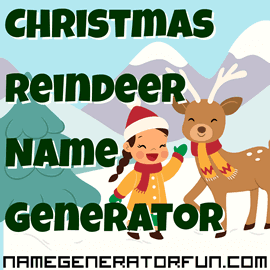 The Christmas Reindeer Name Generator - Holiday Fun for All! Do you really love giving Christmas gifts? Do you jump with joy when the snow starts to fall? Do you like prancing on rooftops and eating carrots? Do you have the urge to fly through the air pulling a sleigh covered in jingling bells? Then you've found the right place! Embrace Christmas and spread some seasonal fun with our reindeer name generator! We've given our reindeer Finnish first names, because Santa's reindeer are said to come from Lapland, in the far north of Finland. We decided to give the reindeer names based on special features they have, like Rudolph's red nose, and we gave them a nickname based on their special talents. If Rudolph was in our generator, he would have the name Rudolph Rednose The Glowing! The first properly recorded reference to Santa Claus having his sleigh pulled by reindeer occurred in 1821, when an illustrated children's poem called 'Old Santeclause With Much Delight' was published in a small paperback book entitled The Children's Friend: A New Year's Present, to the Little Ones from Five to Twelve. The poem was accompanied by eight illustrations (although the name of the poet and illustrator are now lost), and one of the illustrations showed a cheerful Santa with his sleigh being pulled by a single reindeer. However, the mythology of the reindeer was yet to receive its most memorable addition, which eventually arrived thanks to a children's book commissioned by Chicago department retailer Montgomery Ward. Writer Robert L. May was tasked with writing a book about one of Santa's reindeer that could be sold in Montgomery Ward's stores, and when a thick fog rolled into downtown Chicago from Lake Michigan, he was inspired to create a reindeer with a bright red nose that would help Santa to navigate. Rudolph the Red-Nosed Reindeer was born, although the idea initially faced some resistance since in the 1930s, a bright red nose was largely associated with chronic alcoholism and drunkenness, and May had to get an illustrator friend named Denver Gillen to design an especially cute reindeer (using deer in New York zoos as inspiration) in order to fully sell his bosses on the idea. Rudolph the Red-Nosed Reindeer went on to be a smash hit for Montgomery Ward in 1939, and was later published in a mass-market edition in 1947 which spread the character's popularity even wider. A sequel was published in 1954 – Rudolph the Red-Nosed Reindeer Shines Again – and a third sequel (originally written by May in 1947, but unpublished) finally saw the light of day decades later in 2003. Much of Rudolph's iconic popularity is down to the 1949 Gene Autry pop song 'Rudolph the Red-Nosed Reindeer', which tells a different version of the Rudolph story and was written by Robert L. May's brother-in-law Johnny Marks. Despite these differences, the song achieved an astonishing level of success – it ultimately sold 25 million copies, and remained the second best-selling song of all time for the next three decades. Rudolph's popularity as a character received another boost thanks to the 1964 animated TV special produced by Rankin/Bass, which based its story primarily on the song rather than the book, and which added characters like prospector Yukon Cornelius and narrator Sam the Snowman. Two movies in later decades also featured Rudolph – Rudolph the Red-Nosed Reindeer: The Movie in 1998, and Rudolph the Red-Nosed Reindeer: Island of the Misfit Toys in 2001, and the character has also appeared along with Santa's other reindeer in a variety of animations and motion pictures including The Santa Clause (1994), Annabelle's Wish (1997) and Arthur Christmas (2011). We hope you enjoyed our reindeer names! If you did, we also have Christmas elf names! Image Credit: Reindeer designed by Freepik. Licensed under CC BY 3.0.